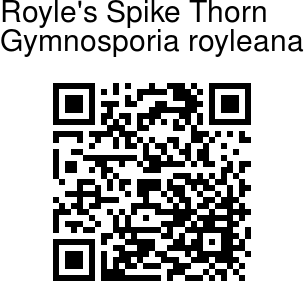 Royle's Spike Thorn is a shrubs with very spiny straight or slightly zigzag branches. Thorns are sturdy, 1-2.5 cm long in leaf axils. 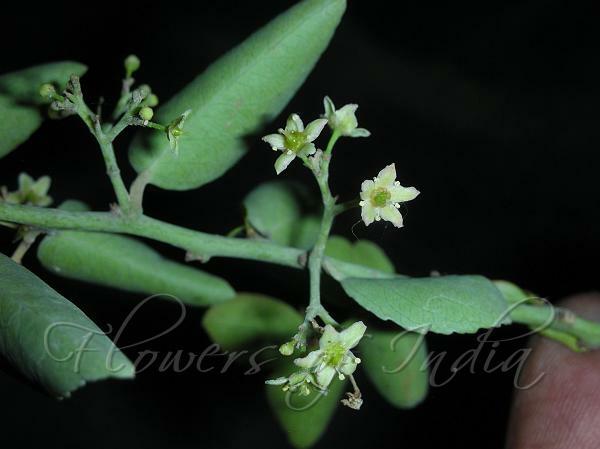 Leaf-stalks are 2-4 mm, leaves obovate or elliptic, 1.5-4 × 0.5-2 cm, thickly papery, base narrow, margin entire or not slightly toothed, tip pointed to blunt, rarely rounded. Lateral veins are 5 or 6 pairs. Flowers are borne in 1 to several, fascicled, 1-7-flowered cymes. Petals are white, oblong-ovate. Capsules are obtriangular, about 1 mm, splitting open into 3 valves. Seeds are long ellipsoid, black, about 6 mm; aril red, nearly covering seed. Royle's Spike Thorn is found on mountain slopes of Afghanistan, India, Kashmir, Pakistan, and parts of China. Flowering: all year.